When you’re knitting stripes or working with multiple colors, the last thing you want is to have lots of ends left over to sew in! 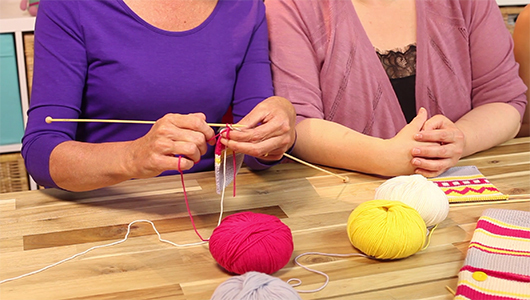 Instead of breaking and introducing the yarn at every color change master this easy trick! Carrying yarn is the crafty knitting technique which sees you take the yarn you are no longer using and carry it up the side of your work, so you can reintroduce the color to your project later on. Perfect for stripes, where you need to regularly switch colors, this is a fantastic simple knitting skill which you can learn in two simple steps! 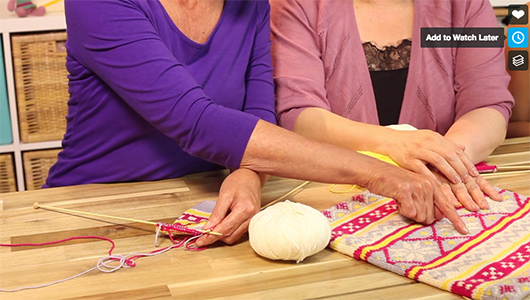 While this tutorial will teach you how to carry yarn, if you would like to learn how to introduce a whole new color to your knitting project, watch our Changing Colors tutorial to guide you through the steps! Insert the right needle into the first stitch. Place the yarn to be carried over the working yarn.